The mega insane hacks you wish you thought of first. Each team will be awarded their choice of AirPods, Holy Stone drones, or VANKYO projectors. The best hack as voted by YOU. Each team member will be awarded a UE Boom 2 Speaker. Think big and scalability. Each team member will be awarded with an Amazon swag bag and $25 Amazon gift card. Best use of WebX/Meraki API use will receive a camera. Come play our arcade challenge and get 8/10 to enter the raffle. Winners will receive an $100 amazon gift card! #1: Use the Geotab API to recreate vehicle Trips History page with Geotab data and Google Maps #2: Use the Geotab API to create a vehicle summary page that allows a user login, choose a vehicle, and then displays various vehicle information. Each team member will win Geotab swag, OGIO backpack, Garmin Vivo fit watch, Google home mini! The hack with the best use of the Gnosis Safe contracts. The team will be awarded with hardware wallets to each team member, GNO worth $300CAD and Gnosis swag. Best eCommerce app using real world data (provided in the #sponsor-gorilla slack) will be awarded headphones, earbuds, swag and exclusive invitation to our next games night! Best use of an IBM Watson API will receive a Drone. The best hack built using the INTERAC e-Transfer Open API (BETA). The winning team will be awarded with $1000. The best hack using pre-rendered data and radio telemetry to identify if a wireless connection is adequate or if a new connection must be sought out. The team will be awarded with a Martello Hackathon Starter Kit: Protocol Air Drone, Razer Headset, Corsair RGB keyboard, $100 Amazon gift card, and guaranteed job interview. Best hack using Microsoft technology will be awarded an Xbox One. Most innovative financial application: An innovative financial solution with the potential to impact the financial industry. The winning team will be awarded $3000. Tactio on FHIR: Craft your patient app with our digital health API. Each team member will win a Tactio Health Jacket. The best hack to follow the Tangelo Games prize spec (available on our live site). Each team member will be awarded with a Nintendo Switch. TD Most Green Hack: Whether it’s the environment or money, TD wants to see how you can incorporate being Green into your Hack. The most environmentally green or finance/money related hack created (or even just the colour green!) will be awarded $50 pre-paid Visa cards to each member of the winning team. Best use of IoT and/or AI to help foster sustainable cities. The first place team will be awarded a $800 prepaid VISA gift card and the second place team will be awarded a $200 prepaid VISA gift card. Both teams will get preferential placement in our application process. Best use of Twilio API. Each member of the winning team will be awarded Sonos Original Play:1 Wireless Speaker. The most fun and creative game dev hack. Each team member gets a $20 Steam gift card. The most ~aesthetic~ hack sporting nice UI/UX. Each team member gets Sketch software license. The best hack made by a first-time hackathon team (at least half of the team are first-time hackers).Each team member gets a JetBrains IntelliJ Ultimate Idea license. The best hack to fail spectacularly. Each team member gets a PIKTEK gaming mouse. The hack that drove its team to delusion. Each team member gets a Tile Mate bluetooth tracker. The best educational hack that could teach us a thing or two. Each team member gets Wolfram|One and Wolfram Alpha Pro subscriptions. The most ~sustainable~ hack that can help make the world a greener place. Each team member gets their very own pack of stainless steel straws. Yup, you read that right. The best hack that screams "sh*t that nobody needs". Each team member gets Spigen AirPods wires. The best hack that just makes you feel good inside. Free hugs and a few extra goodies will be awarded. 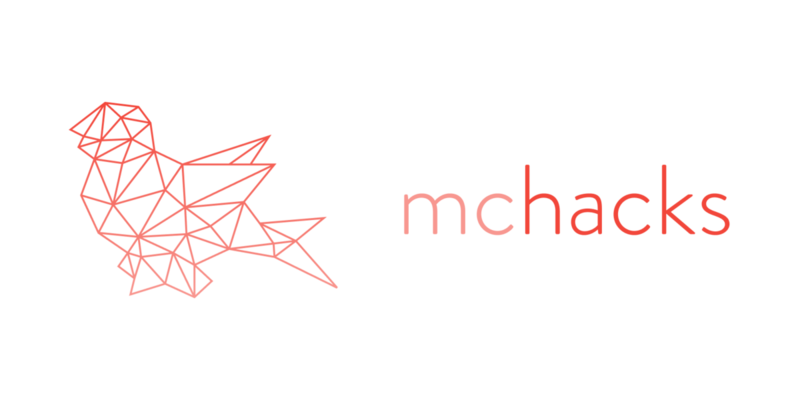 Create, build, and play with us at McHacks, Canada's favourite hackathon. McHacks isn't your typical hackathon, and our hackers aren't either! For 24 hours, over 500 of the boldest young minds in North America come together for a weekend of beginner-to-pro workshops, decked-out hardware, delicious food, and some epic hacking. If you applied to McHacks 6, received an acceptance and also confirmed your attendance, you are eligible to attend McHacks. If you attended and participated at McHacks 6, then you are eligible to make a submission. Each team must consist of no more than 4 participants.